Hey gang, I have been trying to move an entire gif animation and sort of center it over and exsiting plain image. I have a little gif of a fight scene. I cant seem to move the frames in one blow. I can only see this being able to be done one by one and that is too tedious. I am not a noob and I have done plenty of work in the past with other software. Example of what I have done with another program, not Ulead. For some strange reason, when I go to the object properties while I have the entire fight animation selected, all the options are greyed out but if I only have one frame of the fight, it's not greyed and thus is leaving me to move the frame one by one and that is just too much work. What gives? Help me out here for those of you who have mastered this software. Open the background image with GA 5. Then click the "Add Image" button on the Standard toolbar. 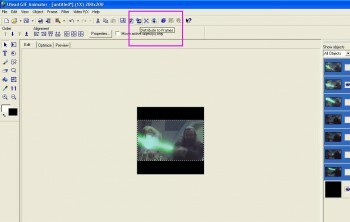 Find and select your little fight scene gif file and click Open. As of this moment, you should have the Object Manager full of the objects from your imported animation, and all of them should be selected. Select the Pick tool, and make sure the Attribute toolbar shows "Move active object(s) only" checked. Click and drag the objects to where you want them. Select source image - leave this at the frame showing. Attributes - select X offset and Y offset only. Note that the frame delay from your small animation will not be preserved. The other way to do this is to open the small animation first, then add the background image. On the Object manager, you'll have to click and drag it to the bottom of the list. With that object still selected, click Edit, Crop Canvas. This will let you see the whole background. Next, you would position the background to where you want it. Repeat the Crop Canvas to again get everything properly placed. 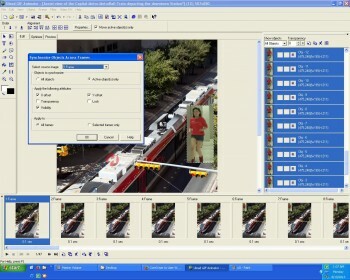 You would use the Synch button as in the previous example, having only the background object selected in the Object manager. This time, you would also select "Visibility" in addition to X and Y axis. VikingAnimations, I was hoping you would come and help me today. I just glanced over your info and I will put it to work in a minute. Thank you for running that down for me and I am glad you understood what I was trying to do. I am going to make the badest boxing sigi on the planet. I will be back to show you how it came out. Trial and error and after about an hour, I got it. Even though you explained it very well, I was still leaving VISIBILITY checked only because I was just looking at the image example. I finally read the whole thing and I saw what I was doing wrong. I was not going to give up because I knew that you knew what you were talking about and I knew that I was doing something wrong. I never give up. Thank you once again for that awesome mini tut. Now I am off to make my Sigi. Glad you got it figured out. Looking forward to the final result! VikingAnimations,I tried the way you explained but something is not working. My gif has 47 frames; a girl runnning. I moved the 1:Frame to my desired position; a person chasing a train. And all frames are the first frame (1:Frame) instead of a moving frames from 1: till 47:. I successfully accomplished the train + girl gif but did not recall how I did it. Now, planning to insert a gif in inside a gif. 61 frame gif into a 61 frame gif. Open the animation you want in the background first. Make sure frame 1 is selected. Select the Pick tool, make sure "move active object(s) only" is NOT checked. Position the second animation where you'd like it. Finally, I get it now. 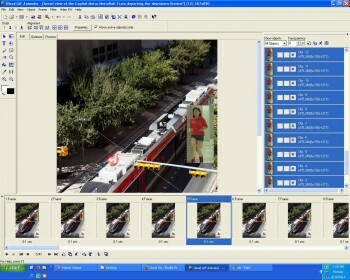 'Add Image' and the move Frame 1 to the desired location. And then syncronize it; 'Distribute to Frames'. Where did I save the txt manual.